I really love grocery shopping. Well, let me rephrase… I really love grocery browsing. It’s a real thing. My husband makes fun of me because we go places on vacation and what do I want to do? go sightseeing? No. Go lay on the beach? Well yes, but before I go to the beach, I want to stop at the market 1 – to get food 2 – to look around. I basically just want to visit all the markets. I especially like ethnic markets. You can find so many interesting things in an ethnic market and its usually really inexpensive. I love getting lard, chicharrones, plantains, and yucca root from the Latin market. I love getting coconuts, okinowan sweet potatoes, and seaweed from the Asian market. I love getting halvah, tahini, and lamb from the Middle-Eastern market. If you travel to different places, visit the local grocer and farmer’s markets. You can learn A LOT about a culture by looking at what everyone buys and what is in stock. Additionally, it’s quite delicious. Had I not frequented the Latin market in San Clemente, I would have never picked up this odd looking root called Cassava (or yuca, yucca in other parts of Latin America). Since I also had some lard handy, I decided to make some fries! So delish! You must must MUST make these. 1. Remove the thick skin of the cassava with a veggie peeler or a sharp knife. 2. Cut in half lengthwise, and then in half through the widest part. 3. Boil in a small pot for 20 mins until tender enough to poke the knife through but not mushy. 4. 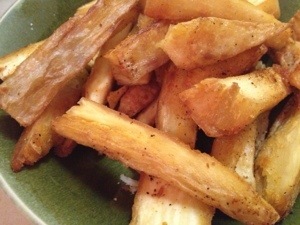 Slice into fry wedges or sticks. There is a tough strand of fiber running through the center of the cassava, remove it. 5. In a small cast iron skillet or heavy bottomed skillet (keep it on the smaller side so the oil doesn’t spread out too much, a small pot would work too.) add oil and heat on medium high. 6. Test the oil by putting a tiny shred of cassava in and see if it starts to sizzle and fry. 7. Add cassava into the oil, one at a time until there is a layer of fries. Don’t try to do them all at once. This way you can remove them all before they get too well done. 8. Let them fry until golden brown. 9. Remove with a slotted spoon and let then drain in a strainer or on a paper towel. 9. Sprinkle with salt and chili powder. — try and pace yourself while devouring. I had very little self-control.